Hello! I am so glad you've dropped by. This space is where I share tid-bits from my personal life + travels, my most recent work and the latest news with SVP. To learn a little more about me, head on over to the "Meet Shauna" page or find me on Instagram. I cannot wait to connect with you! Sign up for the SVP Newsletter and receive news + all the latest updates. You guys! When these film scans hit my inbox I squealed with excitement. You'll soon see why. I had the pleasure of photographing Sommer + Connor's engagement session this spring at Cator Woolford Gardens in Atlanta, Georgia. It was such a perfect backdrop for their love story. I'm looking forward to their wedding this fall at the Georgian Terrace! I had such a lovely time with Jensie + Charlie a few weeks back capturing their spring engagement session in Serenbe. Their fun and free-spirited love was a really treat to document. You may recognize Jensie from Pinterest or Instagram. She's a well-known Atlantan fashion blogger. You can visit her blog here and follow along with her on Instagram here! Go show her some love! This Atlanta engagement session was a little extra special for me on my journey as a film photographer. Over the last few years I've been shooting hybrid. Basically that means that I shoot with my Contax 645 (medium format film camera) and Canon 5d Mark III (digital camera, mostly as a back-up). For Jensie and Charlie's session I took the leap and only shot film. 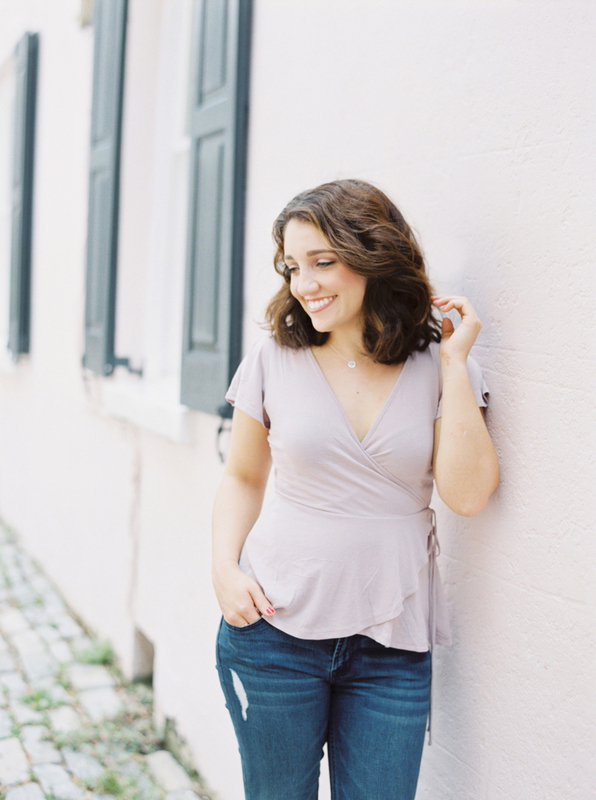 I'm beyond pleased with how their film images came out and am thrilled that I pushed myself. Hopefully this means a lot more fully film sessions to come. I can't wait for their Italian inspired wedding this fall at Monteluce Winery. 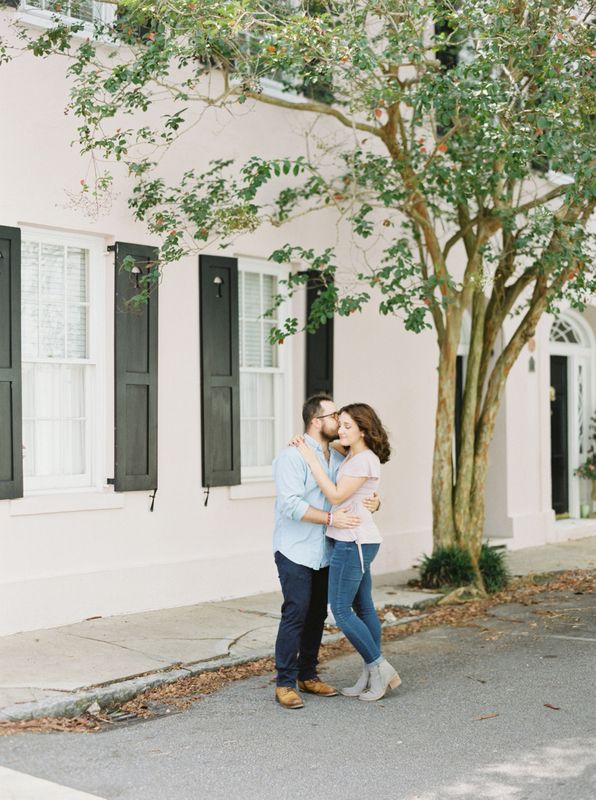 Until then, I'll be swooning over there adorable engagement session below. Carly and Alan traveled with me up to Charleston, South Carolina a few months back to photograph a stunning wedding at Boonehall Plantation (more from that coming soon!). For those of you who may not know, Alan has been a part of Shauna Veasey Photography for over two years now. I was excited to ask the two of them to join me for this destination wedding and am so glad they took me up on it. We had a blast! Boonehall is one of my favorite wedding venues in the south and I couldn't have picked a better pair to be with while checking it off the Wedding Venue Bucket List. While we were there we got an Air B-n-B and made a weekend of it. We did some sightseeing and exploring so of course, I had to snap a few film photos of my favorite duo in one of my favorite little cities! Below are some of my favorite photos from our trip! Carly + Alan, it has been such a blessing to watch your relationship grow over the years! Thank you for allowing me to document your love. I can't wait to see what God has in store for the two of you. I adore you both and am so thankful for your friendship! I love you guys!